"I wouldn’t start from here at all"
Readers in England who enjoy jokes about Irish countrymen, will recognise this as the punch line of the well known story of an American tourist who is trying to reach Dublin from a remote rural location. The countryman made several attempts to describe to the American how to set about this journey, but gave up in despair with the suggestion that he go to somewhere else and start from there. Whether this is a fair assessment of the way Irish logic works I am not competent to judge, having never been there. What I do recognise however, is that the story is a striking parable of what Don Juan Matus, the initiate in Carlos Castaneda’s 1950’s books about shamanism in the Sonoran desert region of Mexico, was trying to teach Carlos. It is utterly impossible, the shaman taught, to achieve a true transcendental experience of earth reality without a total shift in the nature and direction of human attention. Don Juan talked from time to time to Carlos about what he called ‘The Second Attention’. He indicated that if Carlos could learn to abandon the preconception acquired through looking at the world with his ordinary perceptions and ideas, and follow instead his intuition that it was possible to observe reality from a totally different starting point, he would start to observe that somewhere within range of his awareness there was a new point d’appui. With this so called ‘second attention’ one could recognise a possible departure point for what Castaneda called ‘A Separate Reality’. Don Juan called this point d’appui ‘The Assemblage Point’ and indicated that we all have one, and that some people can experience it as having a specific location in the physical body. At the same time as Don Juan was teaching Carlos verbally, his colleague Don Genaro from time to time shocked Carlos out of his complacency by seemingly magical acts attained purely by a shift of attention to a separate reality. Over the years I have spent much time struggling with these concepts. I suppose this time, much of it at night, maybe described as one aspect of ‘meditation’, though this is a term I have great difficulty in associating with my own experience. However, it has been accompanied occasionally by the awareness that an entity that seems to be associated with the name ‘St Germain’ was using the fruits of my struggle to awaken my own assemblage point. On occasion, for an aid for his own agenda with people, he has invited me to remove blockages from the brow and crown regions of individuals, and even groups of people, in preparation for the time when their ‘third eye’ or brow chakra is ripe for spontaneous opening. Of late I have begun to wonder whether there is a much closer connection between these two paths of experience than I have realised hitherto. Is it perhaps the case that the assemblage point that the second attention seeks is none other than the third eye in the brow chakra, whose opening is blocked simply by people’s failure to move away from the ‘first attention’. The first attention binds us to the conviction that what people in their millions call the real world, is actually the true reality, and not the verbal substitute which ancient wisdom has always insisted it is. They called it ‘Maya’, a consensual substitute for the reality, which each individuality has to create for itself. A parallel path to this has opened up for me over the last thirteen years in connection with the paranormal events we have come to know as ‘crop circles’. I have always been uncomfortable with the notion that these pristine two-dimensional forms in the plant world are the product of entities which invade the world of wheat and barley from outside. They seem to me to be so much a part of the crop world, with their biological, cellular links with the growth processes of the corn itself. Some people experience this so intensely that they have the feeling that the forms are not invasions from outside the world of nature, but actually emerge from it, from below upwards as it were, as an extension of the whole biological earth process. In the last six or seven years (this is written in 2003) geometricians in the field of crop-circle studies, like Michael Glickman, Alan Brown and John Martineau, have observed a mathematical progression with an odd-number sequence from year to year from five through seven, nine, eleven, thirteen in 2001 and then again thirteen in 2002, culminating in the giant fractal formation on Milk Hill with 409 individual circles, the largest formation ever recorded. Then in 2003 there was a considerable reversion to five-fold forms, dominated by pentagrams. Since about 1996 or 7 the forms have been fascinatingly complex. However, the simple inexpert observer has found it quite difficult to orient oneself in them. Now, suddenly we have had forms so simple that we can walk round them and know exactly where we were almost without a diagram or aerial photograph. This year in the Green Street formation in Avebury, I found myself standing at one of the sharp points of the main pentagram and looking inwards towards the centre. To my amazement the point was so sharp that it was only five or six corn stalks wide, the formation itself being 160 ft. across. I realised that my body was having a transcendent geometrical experience. I have always had difficulty with the widespread notion of ‘circle-makers’, conscious entities of unspecified or even unknown status, but beings people could communicate with, with some expectation of a comprehensible reply. A few days before the 2003 Glastonbury crop circle conference, My partner, Gudrun Pelham, had a communication from an entity she and I have come to know as the ‘King’. This amounted to a warning, which she later read to the conference, not to confuse the living thought forms implicit in the impeccable geometry of the crop formations with entities which were pictured as creating them from outside. Gudrun is a gardener. Many plant lovers, especially gardeners, are familiar with what happens when they talk to their plants. Like crop-circles, plants are physical manifestations of living thought-forms, living but not conscious, in the sense that they cannot respond to their loving cultivators in the same language that they are addressed in. You can think with your roses and lovingly address them in their own thought language and you know that this affects them at a heart level, and that they respond by flourishing more vitally as plants, but you cannot conduct a verbal conversation with them, because they, unlike you, are not conscious. The same applies to crop-circles. The King pointed out to Gudrun that crop circles are living thought forms, implicitly manifest in the medium of wheat or barley but they are not conscious thought forms imposed on a crop from outside by circle makers with whom it is possible to communicate consciously. There is a valid analogy here with a gardener who has an ongoing dialogue with her roses. She is aware that the flowers are responsive to her ministrations, but she does not expect this to be verbal. It takes the form of increased vitality. Sometimes they can even respond to her wishes in respect of the direction and style of their growth. But it is in their life forces that they respond, not in a manifestation of conscious awareness. I suggest that exact observation of the nature of the response of crop-circles to cognate attempts on the part of croppies to induce their fresh appearance in the fields and sometimes to influence the forms themselves, may lead them to similar conclusions. In fact, the more one observes crop-circles the more one becomes aware that their modifications, even one can say, their evolution over time, has something distinctly plant-like about it. Have you noticed, for example, that when crop-circles appear in new localities they can sometimes follow a similar evolutionary path to that followed in southern England in the late eighties. First there were simple circles like seeds, then there were more multi-cellular forms like crosses or morulae, and then suddenly bursting into stem-like linearity as at Alton Barnes in 1991 and from there on with increasing variety and complexity analogous to flowering and fruiting. These realisations only came fully to birth in me earlier this year. I started to sense a connection between two processes. One was occasional discontinuous bursts of awareness, new insights connected with the millennium crossing from 1998 onwards. The other process was slow and painful, a continuous movement towards a different perception of time and space. I perceived a steady foreshortening of the nature of time, a loss of linearity, and different feelings about the nature of causation, more of a continuous present, an emphasis upon now as our own valid connection with reality. I saw that other crop-circle aficionados were going through similar changes of awareness, notably Andy Thomas in the evolution of his lectures and recent books, towards a continuous present. Similarly Palden Jenkins in the centring of his broad historical perspectives on a social healing which includes everyone. There are many other examples. The connection between my own ‘burst-of-awareness’ process and ‘gradualist third-eye stuff’ clearly owed a lot to the St Germain task I have referred to, which by now had touched about sixty people. This had clearly reflected back on my own brow chakra and set off the speculations I have referred to about the nature of Don Juan’s assemblage point. The whole experience culminated for me, as I have already indicated, when I found myself alone on that day in July this year in the multiple pentagonal formation at Green Street in Avebury. Standing at one of the five points that met the rim of the formation I felt that this was a situation in which a second attention was about to perceive how my third eye, already partly opened by other experiences and thoughts, could become fully identified as an assemblage point. So I knelt on the ground facing the centre of the formation and lowered my third eye to the exact point of the pentagram. My eyes were closed and behind them I instantly perceived an image of mind-blowing simplicity. Why on earth had we not all, we croppies, not perceived this before, perhaps even years ago? Of course! 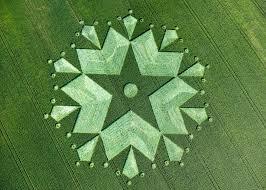 This crop circle was simply a PLANT, no more and no less. A plant! The question we should have been asking all these years was not who makes crop circles, but something much simpler and much more fundamental, namely, what on earth has happened to the plant world? What on earth is going on there? The direction in which the answer to this question must lie was immediately apparent to me, which it will also be to you if you are familiar with Goethean science, (as opposed to Newtonian), as expounded by Rudolf Steiner in his spiritual science (known as anthroposophy) now for over a century. Steiner prophesied that a huge change in our human mind-set would occur at the end of the twentieth century. He described it in this way by saying that the whole of mankind would cross into the spiritual world at this time. If you are one of those who has been expecting this sort of change for some time, and many who have never heard of Rudolf Steiner are in this category, and are now experiencing exactly this kind of change in the world, you will find the explanation that I am now giving of crop-circles exciting, but not all that surprising. In Steiner’s terms, the three-dimensional world of rock, crystal, water, air and fire is the manifestation of a level of thought forms which are lifeless. Upon this reality are superimposed further levels of manifestation of which the thought forms are not only alive, but as you ascend the scale also have consciousness and even finally self-awareness and freedom of action. These facilities are attained by sacrificing one by one their dimensional extension in space and time, to gain further attributes of a psychic and even of a spiritual nature. From this standpoint what I mean by a plant, when I say I suddenly perceive crop-circles to be plants, has considerably different connotations from those intended by a botanist brought up by a conventional science. Goethe, and later Steiner, looked upon the plant world as something that happens when the world of thought-forms as a two-dimensional pictorial reality penetrates the three-dimensional physical mineral world. Plants in their pure state are not physical at all. By being superimposed on the three-dimensional physical mineral world, they take on a partially physical nature which is not natural to them, bringing with them the phenomena of physical growth and metamorphosis. These phenomena are equally unnatural to the physical world itself, which clumsily translates the smooth transition of form in the pure plant nature into discontinuous stages called seed, stem, leaf, flower and fruit, and so back to seed and start again. Metamorphosis in its true nature is purely pictorial and two-dimensional. It exists in its own ‘kingdom’ called the Etheric as opposed to the Physical reality. We experience this naturally and continuously in the process of Thinking where metamorphosis is seen in its true nature. The plant world and the thinking world are essentially the same, differing only in the degree and style of outward manifestation they reveal. We could continue these descriptions through the animal or astral, and the human or devachanic levels, but that is not necessary for the present purpose. What appeared to me now was the realisation that the millennial threshold crossing was in process of releasing all the ‘kingdoms of nature’ into quite new possibilities of future development. We have seen its effects already in the physical mineral world, for example, in the way in which scientists in the realm of particle physics have begun to experience a responsive resonance to their own thoughts during their experiments in the particles they are investigating. These particles are no more conscious than crop-circle thought-forms are, but being of the same nature as the thought-forms of the investigators resonance can occur. It seems that the millennial crossing has somehow taken the lid off the different kingdoms of nature, revealing hitherto unsuspected possibilities for their further development. In the crop-circle phenomena apparently we are seeing an example of one way in which this is affecting the etheric realm, the world of plants, and the sphere of human thinking that is associated with them. A Cartesian, somewhat materialistic mind-set is incapable of grasping the principles involved. Hence various forms of so-called shamanism have been developing over recent decades in preparation for these apocalyptic events. Everybody experiences these things in a unique individual way. To some people my bald statement ‘crop-circles are plants’ will have no apocalyptic ring whatever. I, for instance, have no idea what goes on in the consciousness of the people I see lying on their backs in the formations apparently with no particular awareness of the form as such. Apparently to some of them, it is just a crop-circle, a form which enhances and extends a particular development process they bring with them from other spiritual disciplines, which are no doubt just as valid as mine. I am certainly not advocating that everybody now starts pushing their second attention beyond its natural point in their development. I also sincerely hope that people who are further along this path than I am and come across this account will give me their advice and help. Meanwhile, I have reached a preliminary insight about crop-circles being post millennium plants, that I hope will be helpful to some others, and lead to some helpful dialogue in the remaining years of my life on Earth.